Orange-Tarragon Asparagus - Classic food that even beginner cooks can pull off - and in less than an hour! 1 Rinse and dry asparagus, trim off woody ends and peel spears. 2 Peel shallots and chop finely. Rinse oranges in hot water, wipe dry and cut into thin slices. Rinse tarragon and shake dry. 3 Scrub potatoes thoroughly under running water and cook in a pot of boiling salted water until knife-tender, 20-25 minutes. 4 Meanwhile, heat butter in a braiser. Sauté shallots until translucent. Pour in wine and broth. 5 Place spears in the braiser. Season with sugar, salt and pepper. Top asparagus with orange slices and tarragon sprigs. Bring to a boil, cover and cook until crisp-tender over low heat, 12-14 minutes. 6 Rinse the salmon fillets and pat dry with paper towels. Brush on both sides with oil. 7 Heat a grill pan (or preheat broiler). Grill salmon in the pan (or broil in a baking dish) for 3-4 minutes. Season with salt and pepper. 8 Drain potatoes and cut in half. 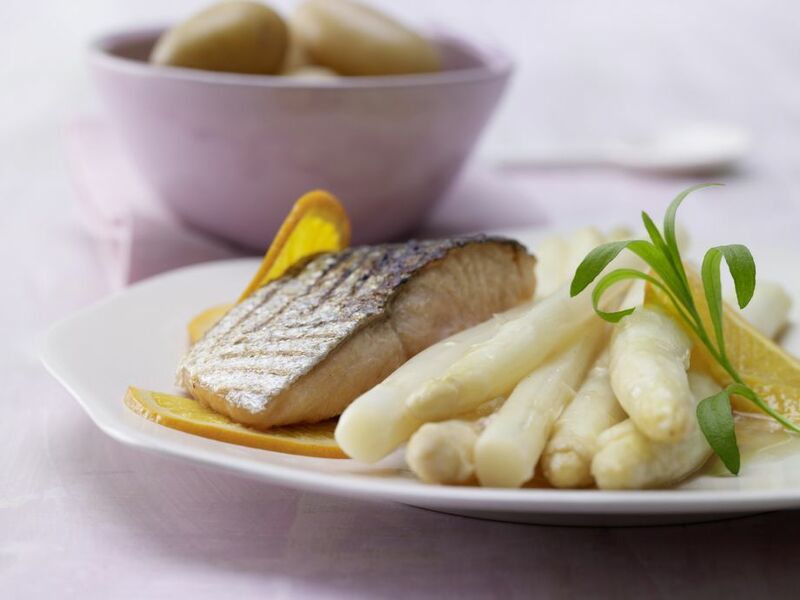 9 Lift asparagus from the broth and divide among plates along with orange slices and salmon. Drizzle with a bit of broth and garnish with tarragon from pan. Serve with potatoes.